The Excel Continuous Process Improvement solution contains Office and PDF documents together with complete Excel templates for strategically improving processes for production and manufacturing. The Excel templates are open with predefined formulas and can be modified to suit particular process improvement requirements. The continuous improvement framework outlines a structured strategy to improve processes through failure identification and analysis, root cause elimination and issue resolution. The strategy cycle includes stages for avoidance, correction, identification and prioritization to ensure optimal output quality with cost reduction and elimination of waste. Process capability CPK calculations for single and double sided tolerances. Statistical process control SPC charting. 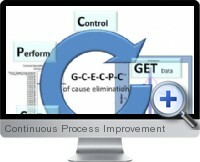 Plan Do Check Act PDCA iterative lean management methods for continuously improving processes. Fall off rate percentage analysis and resolution planning. Key performance indicator KPI development and monitoring. Out of control action plan OCAP strategy development and implementation. Process failure data collection and analysis templates. Designed for generic process improvement including solutions for manufacturing, customer satisfaction, process auditing structures and mechanical repair environments.